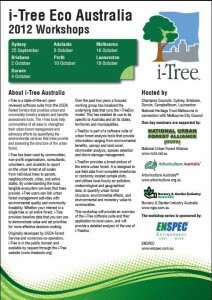 Participants attending the seminars will be provided with an overview of i-TreeEco, requirements for its operation, its application for Australian use, and future opportunities for its ongoing development. Examples of completed Australian projects using iTreeEco will also be discussed. Participants will also be provided with the opportunity to collect field data using i-TreeEco. Workshops run from 8:30 am to 4:00 pm and will be presented by Craig Hinton and Chris Spencer from ENSPEC Arboriculture and Environmental Consultants. The cost to attend is $88 per person which covers all workshop materials, equipment hire and lunch. For more information on the seminars or to register your interest, please click here. Contact Anthony Kachenko at NGIA on 02 8861 5100 or anthony.kachenko@ngia.com.au should you wish to discuss the workshops or the NUFA further.